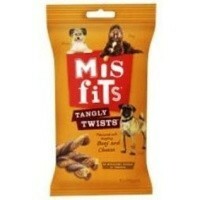 Misfits Tangly Twists are tasty twists flavoured with beef and cheese. These delicious Tangly twists can be untangles, unwound and undone, giving your dog plenty of time to play with his/her treat. Misfits Tangly Twists contain no artificial colours and flavours. Always make sure that fresh water is always available when feeding a treat. Composition: derivatives or vegetable origin, cereals, meat and animal derivatives (including 4% beef), various sugars, minerals, milk and milk derivatives (including 1% cheese), seeds, oils and fats, herbs.